Sakai Community DocumentationSakai 19 User Guide (English) RubricsHow do I add a rubric to a forum topic? Go to Topic Settings for a new or existing forum topic. In the Grading section, choose the gradebook item to associate with this topic. Note: You must have an existing gradebook item in order to associate the forum topic with that item. If there are no existing items, you will need to go to the Gradebook to create the item first. (Optional) Check the box for Adjust individual student scores if you would like to be able to change the number of points awarded for individual criteria ratings while grading student posts on a per-student basis. (Optional) Check the box for Hide Rubric from student if you do not want students to see the rubric prior to posting. Select Save when you have finished setting up the topic. Your forum topic now has a rubric attached. Topics with rubrics attached will display a rubric icon next to the title of the assignment. 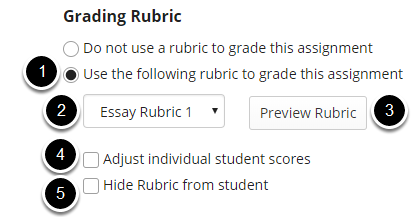 Prev: How do I add a rubric to an assignment? Next: How do I add a rubric to an assessment (i.e. test or quiz)?